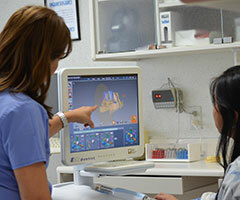 One of the most important things we do for our patients is identify and fill cavities. Since any spot of decay can threaten the integrity of an entire tooth, detection is key to preventing a host of potential problems. Lengthy poking and probing sessions have been an acceptable, but not very comfortable, part of dental exams for years. However, such methods of decay detection are only 50 to 75-percent successful. Cavities can hide along fissure lines or inside biting and occlusal surfaces. Furthermore, mechanical exploratory methods are limited to finding only those cavities that are equal to or larger than the probe head. To make the process more comfortable and comprehensive, we use DIAGNOdent, a revolutionary dental laser that finds cavities in the earliest stages. DIAGNOdent technology uses a laser diode to inspect teeth, comparing reflection wavelength against a healthy baseline wavelength to uncover decay. First, we take a benchmark reading by aiming the laser onto one of your healthy enamel tooth surfaces, shining the laser into all suspect areas. As it pulses into grooves, fissures and cracks, the laser reflects fluorescent light of a specific wavelength that is measured by receptors, converted to an acoustic signal, evaluated electronically to reveal a value between 1 and 100, and then displayed on a screen. Any variation from the healthy baseline value stimulates emission of a different wavelength and alerts us to a weakened area of decay. Not surprisingly, this technology quickly and precisely identifies even the tiniest bit of decay. This means shallower, simpler fillings, preserving more tooth structure, and providing a specific means of monitoring suspicious areas. No X-rays are required with DIAGNOdent, so patients do not have to worry about radiation exposure. Now, when you come into the office for X-rays, a tiny sensor is placed in your mouth to emit a small amount of radiation – up to 90-percent less than the amount traditional X-rays required. This creates a detailed image of your internal oral structures that is immediately viewable on a chairside monitor, carrying with it all the conveniences of other digitized images. We can rotate and magnify it, adjust it for contrast, and even color-code it for educational purposes. The digital images store easily and efficiently in our computer files, safe and sound. For insurance purposes, referrals, or patient education, digital X-rays can be easily, inexpensively, and accurately reproduced. We use intraoral cameras, so when you visit the dentist, you can sit back comfortably in the chair and get ready for the show. The dentist or hygienist will insert a pen-sized, camera-tipped wand into your mouth. Covered with a disposable plastic sheath for contamination prevention, the wand simply takes a video of the inside of your mouth and transmits the images via cable to a computing unit. The computing unit enlarges the full-color images and sends them to a TV screen that you can comfortably view from the dental chair. Aha! There it is – your mouth on the screen. The dentist can point out problem areas and explain his recommendations for treatment, so you’ll become an informed partner in your dental care instead of a clueless bystander. Seeing your dental problems may seem overwhelming at first, but consider the experience a first step toward a healthier, fresher smile. The camera may reveal the early stages of potentially serious problems, allowing you the opportunity to prevent small problems before they escalate. This is especially helpful with gum disease and conditions that cause damage without causing pain. The camera's honest survey can also show you how your regular home hygiene routine is paying off. The dental hygienist or dentist can recommend ways to improve your homecare based on their findings. Dr.Soto treats very complicated cases dealing with temporomandibular disorder (TMD). To accurately assess joint damage due to chronic TMD condition and/or TM joint trauma, joint tomographic images showing slices in different sections is invaluable. High-tech equipment such as the CMT is what differentiates our facility and treatment capability from others.